Actress, comedian and much missed fixture of the New York comedy scene, Kristen Schaal, had her very first one hour special premiere on Comedy Central last week. The extended and uncensored version is now also available on DVD. Kristen Schaal unleashes her unique point of view and unconventional delivery upon San Francisco in the world premiere of her first original one-hour stand-up special, Kristen Schaal: Live at the Fillmore, debuting on Comedy Central on Monday, April 1 at midnight ET/PT. One of Rolling Stone’s “50 Funniest People Now,” Schaal is not afraid to go blue in front of a live audience at the historic San Francisco venue. She will talk about taints. She will perform her magician’s assistant audition and she will share personal insights and stories, all adding up to a hilarious hour of comedy. While she told her longtime collaborator Kurt Braunholer that it “went badly,” I think most folks here will probably still get a kick out of it. 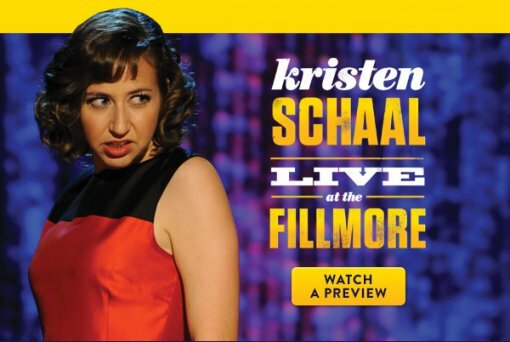 If you’d like a chance at winning your very own copy of Kristen Schaal: Live At The Fillmore on DVD, fill out the contest entry form after the jump. Contest ends on Friday, April 15 at midnight ET. One entry per person, US residents only.